Last year as I was seeking the Lord as to what our 2019 Theme should be, I felt as though He whispered: “Be UNSHAKABLE.” As soon as that idea hit my heart, I knew that is what we were to be! 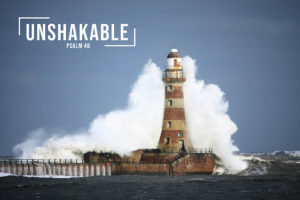 UNSHAKABLE… a prophetic word for us all! The picture is of a Lighthouse . . . and with the waves crashing against it, it still stands. It has seen its share of storms and life has left its marks, but it still stands. Many years ago, there was a prophetic word spoken over First Assembly. That word declared that First Assembly would be a lighthouse, a city on a hill. I still believe that to be true! We must desire the Power and the Presence of God to be at work in us and through us. We must each embrace our calling and giftings. We must together pursue Him with all our heart, soul, and mind. And, then, we will overcome! We will stand UNSHAKABLE. This is a year of breakthrough and promise. We have seen the faithfulness of God and I believe that the best is yet to come.